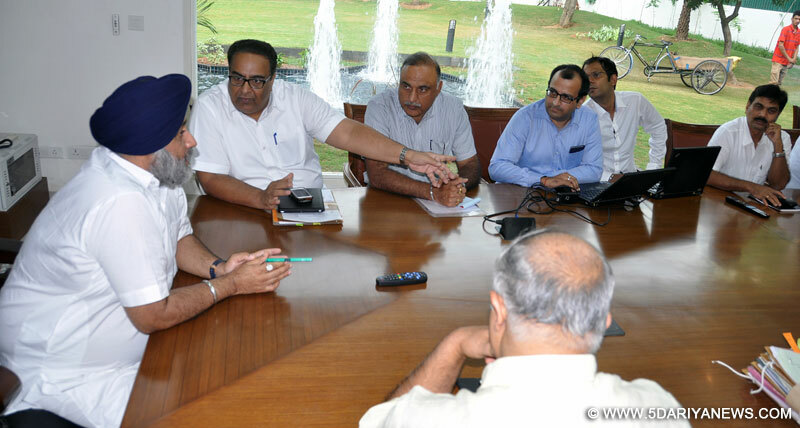 Punjab Deputy Chief Minister Sukhbir Singh Badal reviewing the ongoing e-governance and e-districts projects during a meeting at Chandigarh on 4-9-2014. Punjab Deputy Chief Minister Sukhbir Singh Badal today finalized the setting up of kiosks under unified service delivery system to facilitate common masses by provisioning of 200 citizen centric services and fixed a timeline to make the system operational before July 2015.Reviewing the ongoing e-governance and e-districts projects, Deputy CM reiterated his resolve to eliminate corruption and harassment of general public and asserted that from July next the people of Punjab would get their required services not in-line but online. He asked Chief Secretary Mr. Sarvesh Kaushal to expedite the process of setting up Unified Service Delivery Centers in the state, which would become operational before the given timeline. He said existing Fard, Saanjh and Suvidha Kendras would be clubbed with these centers for delivery of Governance to Government (G to G) and Government to Citizen (G to C) services. Adding further he said in July next Punjab would become the first state in the country by implementing 200 citizen services under Right to Service Act and 100 percent e-governance and e-district projects. While examining the layout of these centers and infrastructure, Mr. Badal directed Principal Secretary Governance Reforms Mr. C. Roul to pide cities into different clusters for setting up of these centers. He said that there should be three-four state-of-the-art citizen facilitation centers in each city at approachable distances with easy access to the public. Mr. Badal emphasized that there should be backend computerization and digitalization of all services in all departments before the given target. He said that this system will make Punjab to become in-line to online state. Chief Secretary Mr. Sarvesh Kaushal apprised Deputy CM that at present 149 services have been provided under Right to Service Act and more 52 will be added as per the directions. He said that there were 16 states including Punjab where e-district project has been initiated and Punjab was the leading state in all aspects.Mr. Badal also asked Chief Secretary to strictly ensure external auditor besides taking monthly report of functioning of these centers. He said that all the manpower should be outsourced by the service provider, where a well qualified, experienced and IT expert staff would facilitate general public. He said there should be a dedicated complaint box besides a central helpline, which would work as watchdog. Deputy CM also asked Chief Secretary that these centers would be open for general public for all seven days with a single off in a month. Prominent amongst others present in the meeting included Principal Secretary Governance Reforms Mr. C. Roul, Principal Secretary to Deputy CM Mr. P.S. Aujla, Secretary Local Bodies Mr. Ashok Gupta, Mr. Manvesh Sidhu and Mr. Ajay Mahajan both Special Principal Secretaries to Deputy CM.